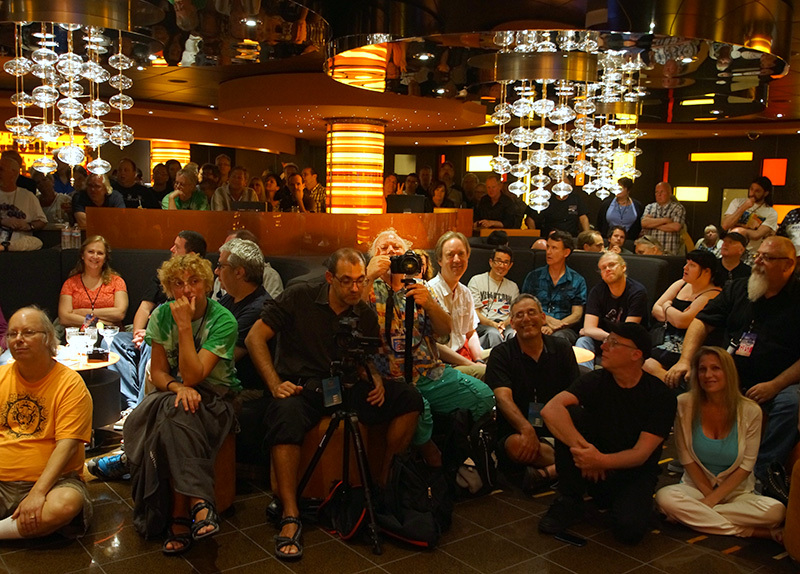 The one real progressive rock music cruise (there was, of course, the comparable Progressive Nation at Sea in February 2014, and Eclipsed reported about it in their April issue, but no one from the German Genesis Fan Club attended). 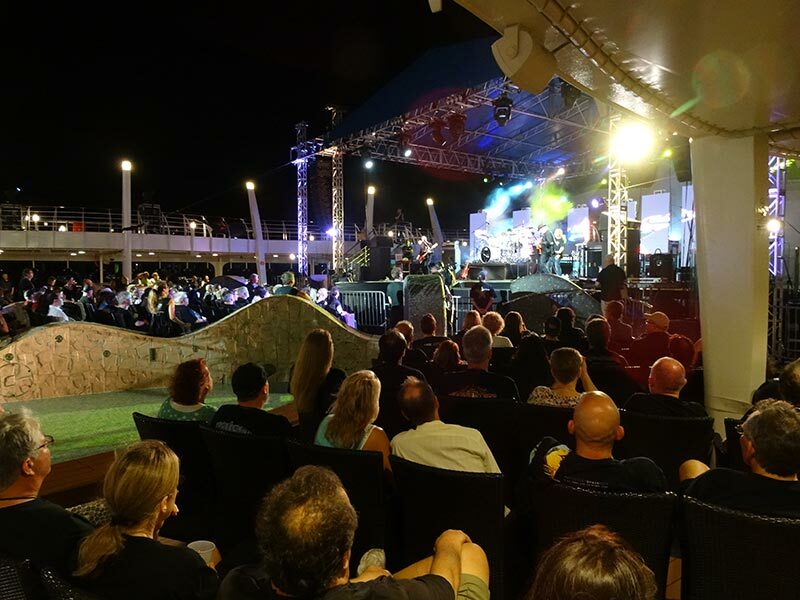 During the last years there has not only been a rise in cruise business in general but also in cruises focussing on special subjects, as, for example, Monsters of Rock or the Full Metal Cruise. 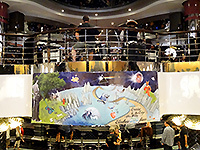 In April 2013 the first Cruise to the Edge aboard the MSC Divina started in Miami. I hesitated to attend that cruise, but this year it finally was inevitable! The name of the cruise derived, of course, from the song Close To The Edge by Yes, who were headliners both in 2013 and 2014. 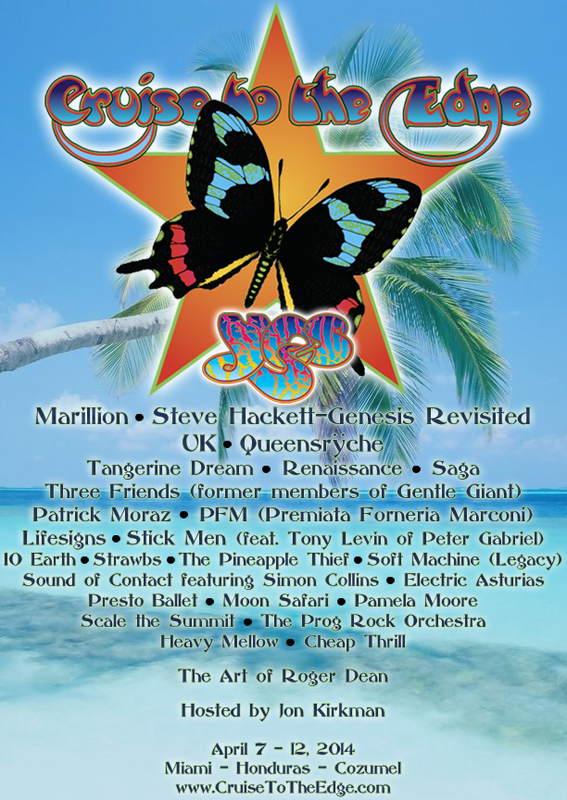 On the first cruise Steve Hackett played one of his first Genesis Revisited shows and many of the other bands also performed on both cruises (see list of all bands on the poster at this link). 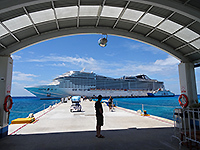 Just like this year, the 2013 cruise had started from Miami to a short side trip to the Caribbean and returned within five days. 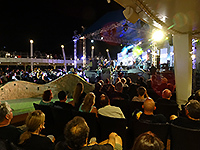 However, only half of the passengers had come to see the concerts on that first cruise, the other half being regular passengers who didn't care for the music. That worked out quite well, yet for this year’s cruise the organisers drew a lesson out of it and reserved the entire ship for the music passengers. 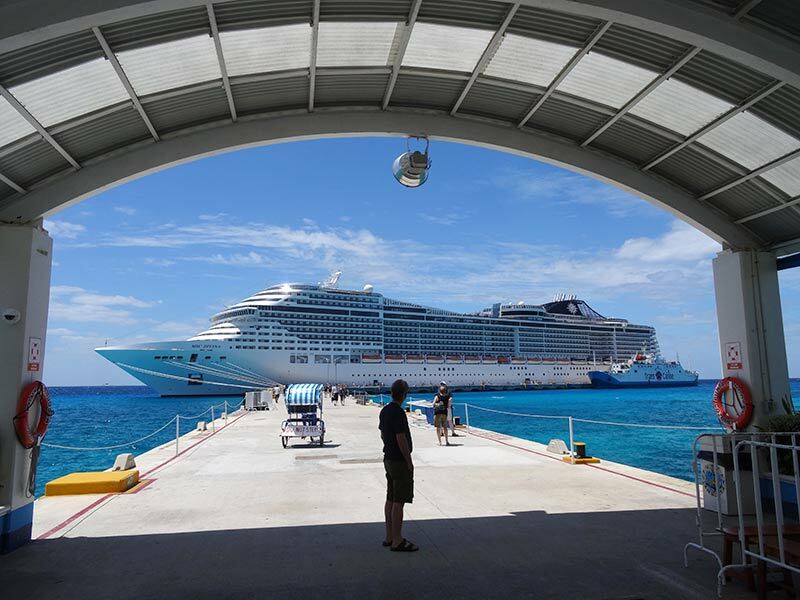 The MSC Divina is able to accomodate more than 4,200 passengers, but only about 2,200 were aboard the ship. That may not have been financially satisfying for the organisers. Still it turned out ideal for the passengers, since the buffets rarely were overcrowded as well as the main shows in the theatre. That theatre has a capacity of less than 2,000 seats, hence the 'big' shows of Yes, Steve Hackett, Marillion and UK have been divided into two groups: The blue and the pink group, according to the cabins. All four bands played two shows on different days and officially you only had the chance to see one of the shows, due to the reservations. In my view this was not a very good arrangement. Of course one would like to see those bands more than one time if there's the chance to do so. 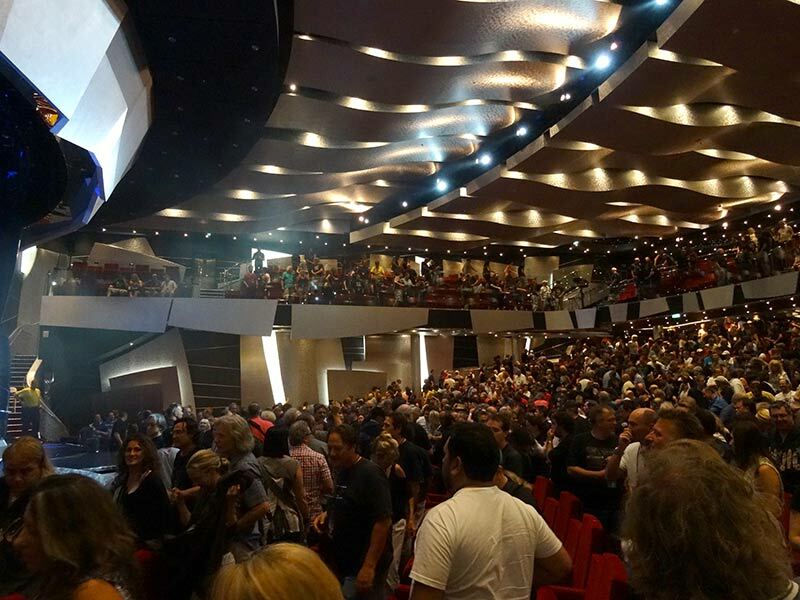 However, it turned out that there was a number of seats for members of the 'wrong' group and that you simply had to wait to be let onto the balcony a few minutes before the concerts began. Since that arrangement hasn't been announced, I only learned about it casually just before the first Hackett show started. So I could see every show I wanted in the big theatre, as long as there hasn't been anything more interesting elsewhere. Of course, that is a problem when so many bands play two or three shows in only five days. Hence I missed the shows of Yes, Storyteller and Stick Men (with guest Eddie Jobson), among others. Altogether there were five main stages: The big theatre, the pool stage, two lounges and the atrium. Each saw three to five shows every day between noon and midnight. In the theatre were many shows without reservations and I never saw people being turned away due to overcrowding. Many of those bands, like Sound of Contact, PFM or Renaissance, had two shows (one in the theatre and one on the pool stage) and one storyteller. The pool area was completely covered to make room for the stage and the seats. 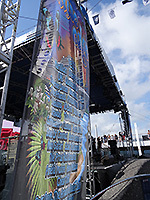 The stage was topped with a sail-like roof, but the area in front had no protection of any kind. Therefore events didn't take place in case of rain, which happened one time. The concert has been caught up on the next day. The rain was part of a storm that rocked our ship to some extend, but that didn't affect the other shows on the other decks. Still, the storm caused the ship not to put into the port of Isla de Roatan (Honduras). Instead we sailed directly to Cozumel, an island near Yucatan, where we stayed for two days instead of just one. There was the possibility to book some excursions, but I didn't take interest in that, as I would have missed some shows. I guess I even wouldn't have complained, if the ship hadn't left the port of Miami due to engine breakdown or any other reason. First and foremost – and even second and foremost – it was all about the music and being among like-minded people and having five days with the comforts of board and lodge (all inclusive except for alcohol and some specialty restaurants). 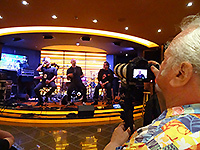 One important aspect of a cruise like this are many guest appearances among the musicians, since many of them are friends or worked together before. 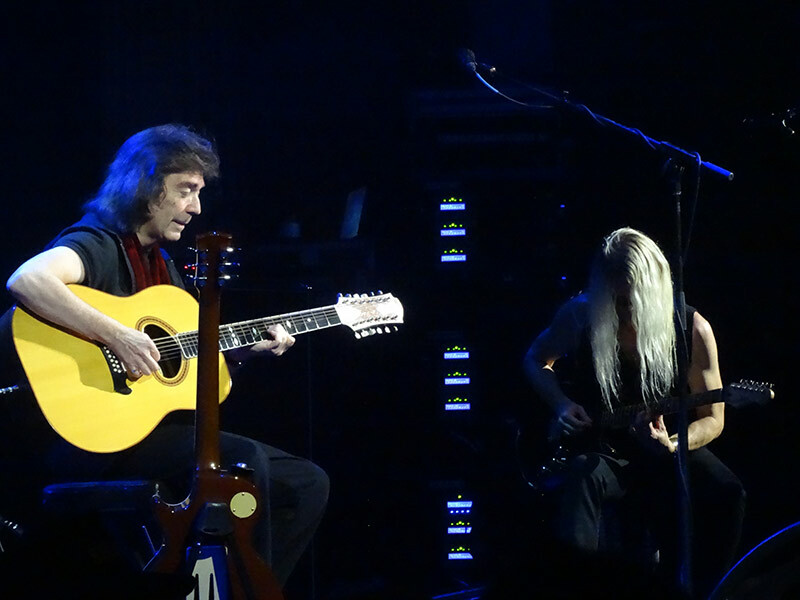 Steve Hackett turned out to be the most hospitable of them: his second show featured John Wetton (voc) and Chris Squire (bass) on All Along The Watchtower, and Simon Collins singing in Supper's Ready. Steve himself joined Simon's Sound of Contact on Fast Forward The Future. He already played the guitar on the recording of the song on Simon's U-Catastrophe record. Unfortunately Marillion's guitarist Steve Rothery was no guest of Hacketts show, probably due to his back troubles, that also came up at their storytellers, where he was sitting most of the time. There were more highlights from the Genesis perspective. 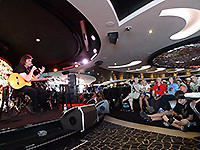 During his storyteller appearance, Hackett answered loads of questions by John Kirkman, the organiser of the cruise, and the audience, and played his usual Horizons and the beginning of Blood On The Rooftops on his acoustic guitar. Another interesting event was the appearance of the legendary Genesis photographer Armando Gallo. In a screen presentation he explictly introduced his nearly finished 'I Know What I Like'-App, and one could get an impression of all its features. Above all there's a lot of browsing and interactivity and loads of previously unpublished pictures for which the space in his book was too limited. For legal reasons, he is not allowed to integrate the music (there are links to iTunes for those who own the records on that platform), still some of Genesis-related persons have put music to his disposal exclusively, among them Anthony Phillips. 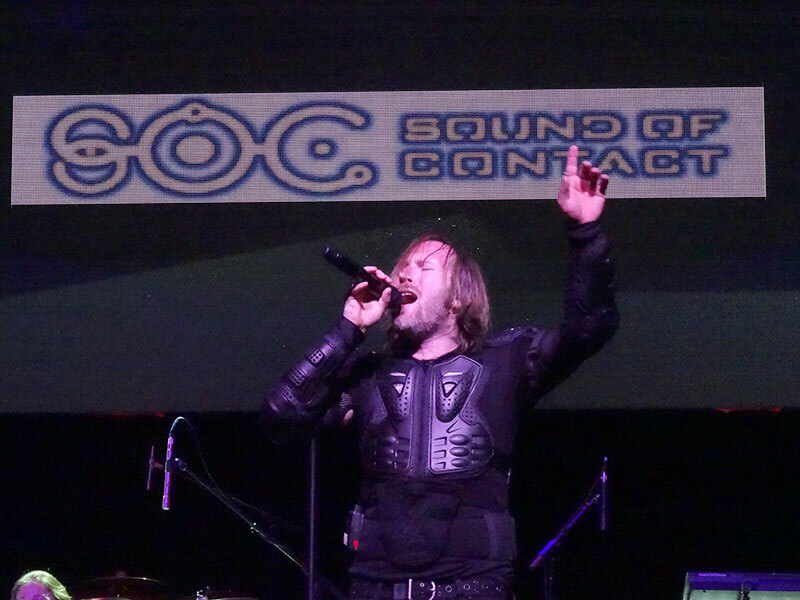 I would like to pay particular attention to the concerts of Simon Collins' band Sound of Contact. First, they played a 90-minute show at the pool stage, in the glaring light of high noon. Then there was his storytellers at the atrium, and finally a 90-minute show at the theatre. They played the complete Dimensionaut album, followed by The Big Bang (playing a drum duet with his tour drummer. 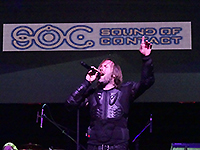 On his U-Catastrophe album it was a duet with Phil and Simon), a rather rock-like version of Keep It Dark, which had recorded in a more electronic fashion in 2007. 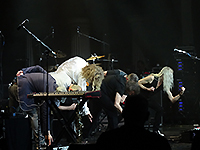 Simon and his band played a much more matured show, compared to last year, and also his singing has improved, which the copious audience honoured with applause. After the appearance at storytellers, he patiently wrote autographs and took pictures with everybody in the queue. A really nice guy! He confirmed that his daddy currently compiles a new band, but he didn't want to say what it will be aiming at. I was quite impressed by the Marillion concerts, most notably by Steve Hogarth, who expends himself every time and unbosoms himself through his songs. Also their storyteller appearance was entertaining (even if they didn't perform anything), and Hogarth could even be talked into playing Easter at the second gig. Also Stick Men with Tony Levin had a storyteller-gig, where I sat directly next to Armando Gallo. (photo by papabear.com) Tony noticed that it can only be a real rock show, if Gallo is there to take pictures. Three Friends, former members of Gentle Giant, had no show at the theatre and only played at the lounges, but their shows were highly popular and the locations were jam-packed. 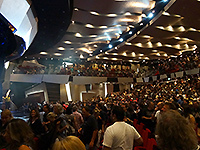 Other bands like PFM, Renaissance and Tangerine Dream each had one show at the theatre and enthusiastic audiences, even if their concerts were less well frequented, caused, of course, by all the events happening concurrently. With most artists there were meet & greets. Since those sessions collected six to seven groups, there were long queues and the people were rushed from station to station. You were allowed to take one picture and to talk a few words (no autographs), then you were pushed to the next. Also Steve Hackett took part, and after his storyteller-appearance he held a real autographing session where all interested persons were served. The concerts mostly lasted to short after midnight, but that wasn't the end of the day. What followed was the After Prog Jam in front of a small bar near the atrium. For that purpose some passengers, who were musicians themselves, via facebook arranged to play some songs. Everybody more or less knew his part, but before midnight they never played together. Accordingly the quality of the performances varied, as the skills of the musicians did. At all events it was very entertaining to listen to songs as Gates Of Delirium, In The Court Of The Crimson King or Carpet Crawlers in that fashion. Musicians and audience were enthusiastic all alike. That certain something was added by Nad Sylvan, who joined to sing Lilywhite Lilith – at half past two in the night. In my view that sounded extraordinarily good, considering the time of the performance. Some members of Yes, as Chris Squire, Geoff Downes and Jon Davison, came to see Gates of Delirium. 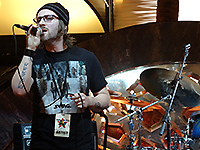 They knew the drummer of that performance personally, if I'm not mistaken. After the sessions were finished at three in the morning, one was invited to use the nearby grand piano to play and sing on. I didn't attend that myself, but Marillion's Mark Kelly is said to have played some classics of his band there. He just came in from the casino at that late hour. Our host, the Liverpudlian John Kirkman, is a an old stager in organising concert tours. He is currently planning an interesting book about Genesis and called for us to share memories, photographies and other memorabilia. The cruise is affordable, if you book an inside cabin with four beds (two bunk beds), with prices ranging from $ 550. You have to add, of course, the flight to Miami and one night accomodation there, since you arrive in the late afternoon when coming from Europe, but have to board the ship in early afternoon. The food aboard and in the included restaurants is good and diversified, and you can eat passably healthy, if you put forth some effort. Italian and Mexican influences prevail, as it is customary in many places of the USA. There also are restaurants you have to pay extra, and there's an exclusive restaurant for the suites on the upper deck. Non-alcoholic drinks are included in the travel fees, but you have to pay for everything above 0%, either per drink or with vouchers for more drinks, fifty for example. Although MSC is an Italian shipping company, but they serve a lot in America, hence there are sockets for the USA and Europe all over the ship. At present it seems unclear, how the cruise will be going off next year, but there was some inofficial talk that it will be equal to this trip, or may even take place in the Mediterranean Sea. As in the meantime the Monsters of Rock cruise has been fixed on the same ship and the same route in early April 2015, I am quite shure that the Cruise to the Edge will follow directly afterwards. 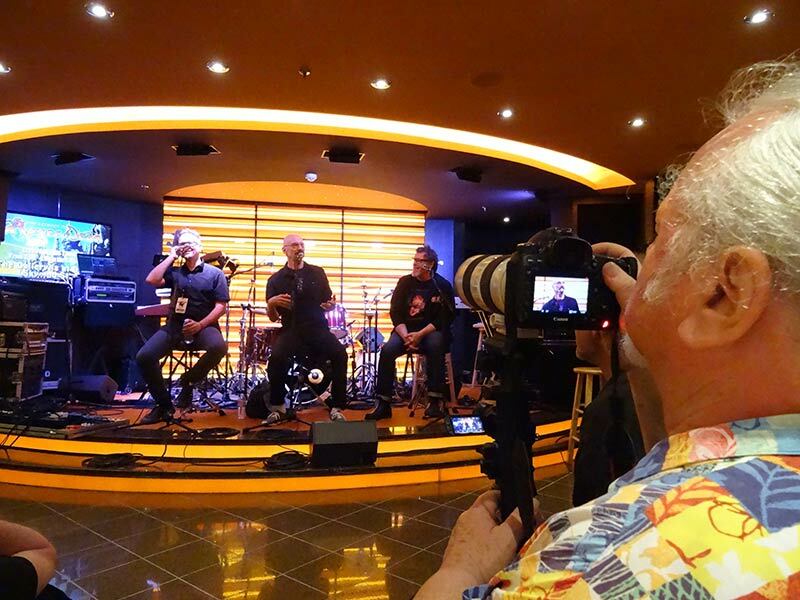 This year there have been three cruises in succession aboard the MSC Divina with the same technical crew: Mosters of Rock, The Moody Blues Cruise and the Cruise to the Edge. Hackett is willing to take part once more. This is not so sure with Yes, but I guess, that will be announced soon. It is likely that between the announcement and the start of the booking, some weeks will pass and that there will be enough time to think about it and to find others to share the cabin. I would definitely recommend it. Since it is only one week, it is neither too short, nor too long.